Patents protect intellectual property, one of the most important assets of any business. A patent excludes others from making or selling an invention, giving a legal monopoly to the patent holder for up to 21 years. Each country has its own patent system and patent laws, so applications and payments must be made in each country for which patent protection is desired. Consequently, there’s no such thing as an “international patent,” but the Patent Cooperation Treaty (PCT) does exist to simplify the process of filing for patents around the world. Utility: Utility patents account for approximately 90% of all patents. They protect functional inventions, specifically “a new and useful process, machine, manufacture, or composition of matter, or a new and useful improvement thereof.” Examples include a new type of computer memory or an improved light bulb. Utility patents last up to 20 years from the application filing date and require payment of maintenance fees during the third, eighth, and eleventh years. Plant: Plant patents protect organic inventions, specifically “a new and distinct, invented or discovered asexually reproduced plant including cultivated sports, mutants, hybrids, and newly found seedlings, other than a tuber propagated plant or a plant found in an uncultivated state.” Examples include a continually blooming rose or genetically altered seeds. Plant patents last up to 20 years and do no require payment of maintenance fees. Design: Design patents protect ornamental features of an object, specifically “a new, original, and ornamental design embodied in or applied to an article of manufacture.” Examples include a specific decoration applied to a vase or a particular shape of a toothbrush handle. Design patents last up to 14 years from the patent grant date and do not require payment of maintenance fees. Reissue: A reissue patent corrects an error in an already issued utility, design, or plant patent. It doesn’t affect the period of protection offered by the original patent; however, the scope of patent protection can change as a result of the reissue patent. Specification: The specification describes one or more embodiments of an invention in regular and detailed language that can generally be understood by someone without patent training. An embodiment is a specific example of an invention; often times several embodiments are included. The specification frequently refers to the drawings, particularly the features that are called out and numbered in each drawing. The specification includes any benefit claims to other patent applications, a brief description of the invention, a brief description of the drawings, and a detailed description of the invention. Drawings: The drawings portray one or more embodiments of an invention. They must adhere to a specific black-and-white line-art format and be annotated with numerals to identify relevant features of the invention. Drawings include perspective, elevation, and cutaway cross-sectional views of an object, as well as flowcharts, graphs, and any other graphics that are useful to show how the invention works. It is extremely rare for a patent to have no drawings. Claims. The claims are the most important part of a patent because they comprise the entire legal description of an invention. While the specification and drawings help to present the invention in clear and concrete terms, they provide no legal protection; they only assist in interpreting the claims. For example, a feature of an invention that is shown in a drawing and described in the specification, but isn’t included in the claims, isn’t part of the patented invention. Disclosure of the feature prevents others from patenting that feature, but doesn’t prevent others from making, using, or selling a product with that feature. Claims are written using extremely general and often confusing terminology. Their purpose is to describe the invention as generally as possible to provide broad patent protection. First, there is no such thing as a provisional patent, only a provisional patent application. All provisional applications expire after one year and are never “converted” into anything (i.e. a nonprovisional application or a patent). However, a the filing date of a provisional application can be accorded to a nonprovisional application for the same invention within the one-year period. Consequently, a provisional application serves as a one-year placeholder with the United States Patent and Trademark Office, during which the invention can be developed or implemented, or a business model for the invention can be tested in the markets. Getting a patent is a complicated and time consuming process, and differs for each type of patent. 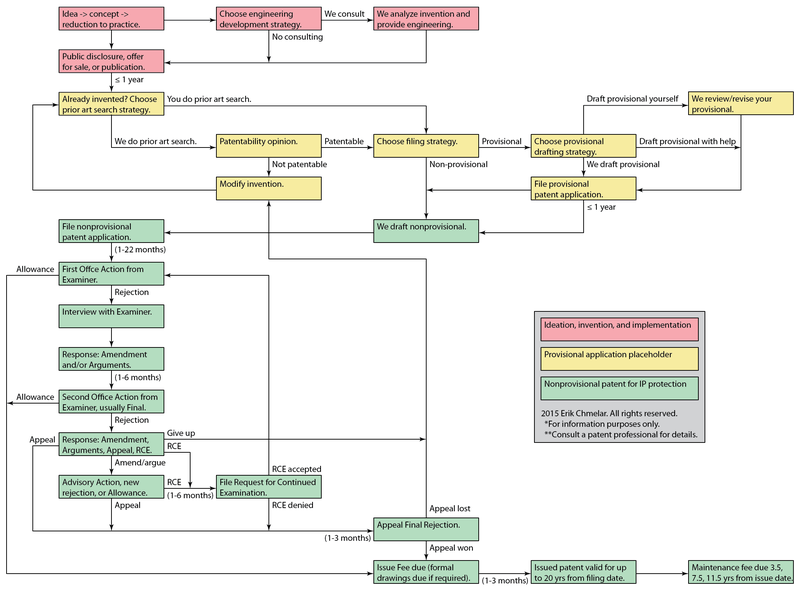 The flowchart below shows a simplified process of obtaining a utility patent, the most common type. Red blocks represent ideation and invention development. This is when the idea is reduced to practice, which can be actual or constructive. A constructive reduction to practice means that the invention has been described in enough detail that someone could actually build it. For most inventions, an actual reduction to practice is recommended because it’ll uncover many unforeseen design flaws and unconsidered design improvements. Once a patent application is filed, no new matter can be added. Either a new application or a Continuation In Part (CIP) must be filed to incorporate new features or modify an invention; a new application is given a new filing date, whereas the CIP has different filing dates for different claims of the invention. Yellow blocks represent the initial steps towards a patent. The purpose of a prior art search is to discover if the invention has already been invented by someone else. Although the exact invention may not be found, similar inventions may exist that will cause the Examiner to reject a nonprovisional patent application on grounds of Obviousness or Anticipation. If similar prior art is found, an inventor can decide not to continue or modify her invention to get around the prior art and continue. Green blocks represent the path towards an issued patent. Almost all First Office Actions are Rejections, and only about 50% of patent applications issue as patents. depending on whether the Office Action is First or Final, the most common Responses are: (1) Argument against the Examiner’s opinion; or (2) Amendment to the patent application to overcome the Examiner’s findings. Request for Continued Examinations and Appeals are expensive and seldom successful, and should be used only in extenuating circumstances. Utility patents are valid for up to 20 years from the filing date, but only if maintenance fees are paid. Fees are due during the third, seventh, and eleventh years. Failure to pay a maintenance fee causes the invention to become public domain, meaning the inventor has lost all intellectual property rights to her invention.